We use monks braid instead of fabric cording mostly on church kneelers and cushions. Most of the pieces that we receive for restoration will have a separate boxing (gusset) and they were originally finished with a fabric cording. 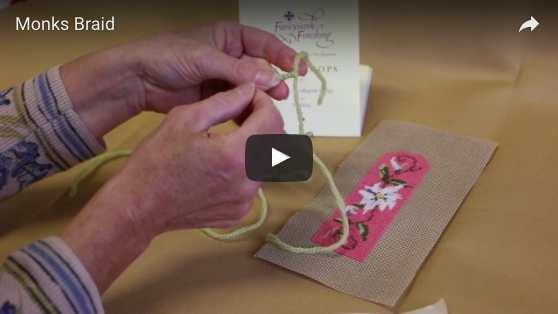 Monks Braid is a great alternative to fabric cording: It is the very last step of completing the restoration. The braid is hand sewn in the “ditch” where the boxing and the top are joined. It wears better than the fabric cording does because it does not protrude above the kneeling/sitting surface — but fits perfectly in the “ditch”. The braid is made from the same fiber as the piece, normally wool, so we are using the same organic material. Because it’s a superficial embellishment, you change the look of the piece without disassembling it: make another braid with a color that is in the design, remove the existing braid that you want to replace and hand sew the new braid in its place. You can also use monks braid in place of twisted cording when finishing Christmas ornaments, Christmas stockings or pillows.